Cool-Run, the new generation semi synthetic kart racing chain lubricant, formulated with an advanced penetrating agent and extreme pressure additives which ensures the lubricant reaches through the links and give 100% protection and lubrication, safe on plastics and rubber, this is the ultimate lubricant for chains with or without o-rings. Manufactured exclusively for professional Kart racing, fully tested and declared safe on all chains including o-rings, will give a minimum of fling, special benefits for Rotax Max dry clutch. For best results apply sparingly to the inside of the chain 3 minutes before practice or race session, this is sufficient time for the lubricant to penetrate the links and set. Will reduce stretching and breakages of chains and sprockets. To be used in all classes from Cadet,Rotax Max,TaG-Racing, Formul A and 250cc Super Kart Excellent resistance against pressure. Enormous resistance against heat. Greatest resistance against water and steam. Superior part synthetic chain lubricant, formulated with extreme pressure additives, flow agent and adhesion aids. Recommended for cadet karting, Honda cadet, Comer cadet and WTP cadet. Extreme is manufactured with extra slip, designed to reduce drag which can help improve on lap times. For best results apply sparingly to the inside of the chain 3 minutes before practice or race session, this is sufficient time for the lubricant to penetrate the links and set. Inside helmet anti-bacterial foam sanitiser, developed to clean away dirt, debris and sweat from helmet lining. Simple to use formulation, spray on and leave for one to two minutes, wipe out helmet with a damp clean cloth, repeat procedure until helmet is clean. Allow to dry. Please protect inside helmet stickers i.e Snell etc as these are not made of sufficient quality and could be damaged. Fresh has been allergy tested and is manufactured with the mildest skin care products. It is recommended to clean inside of helmet after race or practice meeting in order for lining to be giving sufficient time for drying. Special low viscosity ball bearing and ball joint lubricant. 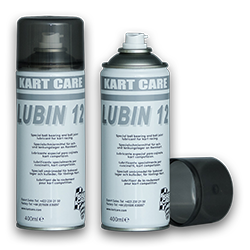 Lubin 12 is a durable dressing for lubrication of moving parts in hostile racing conditions. It provides outstanding drag free lubrication for open and closed axle bearings, ball joints, stub axle and front wheel bearings. The same protection will occur in dry and wet conditions due to its excellent water repellence. Lubin 12 will minimise friction and give maximum speed during a normal race or practice session, application is recommended before each race commences. Is a blend of carefully selected hydrocarbon solvents for the quick and effective clean up of all kart carburettors, both internally and externally for a better performance. One Shot has a fast cleaning power with a slow drying time both of which will ensure the removal of dry petrol/oil mix and gum. Safe on all gaskets and membranes it has been thoroughly tested and approved by the worlds leading kart racers/mechanics. This unique formula repels water and moisture from electric parts in all wet weather conditions. With added ACA (anti corrosive agent) it will give maximum protection to all metal parts from corrosion during wet weather racing or storage. Pay special attention to the spark plug, ignition lead and coil, it is recommended to spray all these parts generously in wet weather conditions. Power House is also an excellent penetrant and lubricant for seized or corroded parts. The ultimate in emulsifiable kart degreasers, Speed Clean will successfully remove chain lube, debris and dirt from pods, nose cones and spoilers, and will remove oil and grease from engines. For the corporative market spray all over chassis and plastics, wait for a few minutes and pressure wash off with either hot or cold water for fantastic results. Contains anti corrosive agents to protect metal parts. Speed Clean will also help remove tyre scuffs from side pods and nose cones. A specially selected blend of hydrocarbon and alcohol solvents, Stop Brake cleaner removes oil and dirt effectively from brake discs and pads. It’s ability to penetrate the brake pads deep into the pores gives a clear advantage over other similar products, yet is harmless to friction material bonding agents. Fast drying and leaving absolutely no film is another benefit Kart Care’s clients appreciate. Stop is also effective on degreasing bearings, engines, axles, sprockets, chains, chassis and dry clutches affected by chain lubrication (Rotax Max). Helmet polish, this new advanced polymer formula designed to enhance and protect painted surfaces. Supa Glaze has been developed for kart racing and forms a hard durable shine, long lasting in both rain and sunshine, Before use shake can well, spray either direct onto helmet or on to a soft cloth, rub all over the helmet and let it work for a few minutes, polish off with a soft cloth. By using Supa Glaze it also reduce drag and or increase airflow over the polished surfaces.